Disclaimer: as I wrote few days back on twitter, I’ll kick off 2015 with a little experiment. 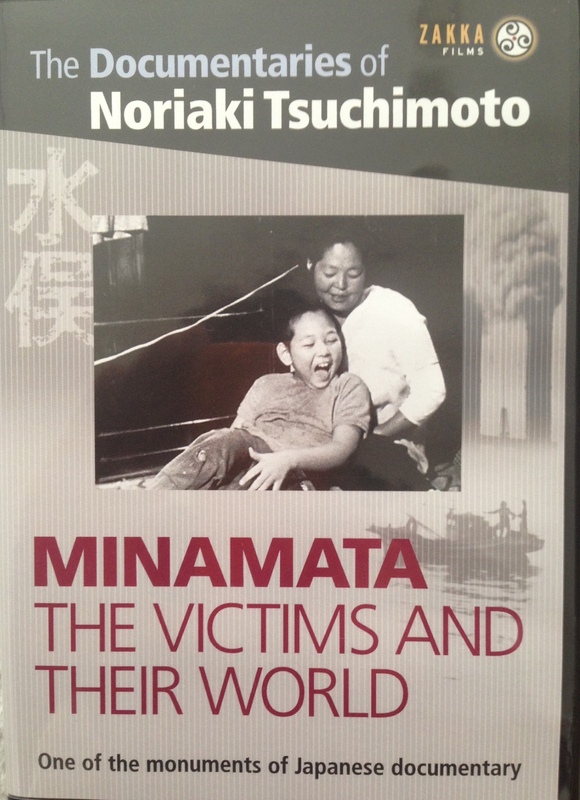 I’ve translated (and partly rewritten) in English my post on Minamata: The Victims and their World. As English is my second language, inevitably some subtleties and nuances of the original Italian piece are probably lost. Feedback and/or suggestions are welcome. Tsuchimoto Noriaki is one of the major figures in Japanese documentary history, and although he also made works about Afghanistan, road construction and other diverse topics, he is best known for the series made in more than 30 years about the victims of Minamata disease. Tsuchimoto first came into contact with the reality of Minamata, a city located in Kumamoto prefecture, in 1965 when he was commissioned to make a short documentary for television, Minamata no kodomo wa ikiteiru. After this experience, when approaching the victims was not as easy as one might expect, he went back to Minamata in 1970 and started to film the lives of the residents in a different manner and to uncover a Pandora’s box of horrors. Minamata had been the scene of one of the largest poisonings perpetrated by man to himself and to the environment, and the city’s name will remain forever linked to the chemical company Chisso, which from 1932 to 1968 polluted the Shiranui Sea and the Minamata Bay with huge quantities of mercury. The metal entered the food chain and caused what is now called Minamata disease (Minamata-byō), a neurological syndrome that was first discovered in 1956. Over the years, the disease has affected more than ten thousand people and killed more than two thousand, but these are just the officially recognized, numbers; the damages and effects of this crime sadly are not always quantifiable or legally provable, and there have been accusations of collusion between the Japanese government and the Chisso corporation to cover up the disaster. Structurally Minamata: The Victims and Their World consists of a series of interviews, conducted by Tsuchimoto himself, with the victims and relatives of those who had been affected by the disease. These interviews reveal the daily lives of the inhabitants damaged by the poisoning: their relationship with the sea, the sickness and the painful memory of the deceased. The interview scenes are interspersed with moments in the lives of fishermen, their habits and traditions, and meetings and rallies in the streets to protest Chisso and the government. It is worth pointing out that the crime perpetrated by Chisso is something inherent in the capitalist system, a tragic result of the dynamics of exploitation of poor and marginal areas and not merely an incident in the course of normal industrial activities. As a documentary director, Tsuchimoto had to face two big problems, (re)gaining the trust of the people whose lives and tragedies were often spectacularized and exploited by the media, as he experienced firsthand when making the aforementioned TV documentary, and secondly deconstructing the contrasting feelings of hate and gratitude towards Chisso that were present in many residents, even unconsciously. Tsuchimoto was well aware of all these contradictions, and one of his major achievements was his ability to achieve a balance between the anger with which he was unmasking the dark side of modernization in Minamata, and the human touch with which he always managed to present the victims and give them dignity. We are introduced to the world of Minamata by a series of information about the poisoning and the Chisso corporation, displayed at the beginning of the documentary. These words substitute for the initial narration, the voice-of-god so often used in mainstream documentaries, and are soon followed by the first images of the area, the lapping of the water and a fishing boat in the sea. This is a highly symbolic start, as the water that dispenses life to the fishing community and upon which the community’s life is based, is the same water that, polluted by mercury, destroys their lives. 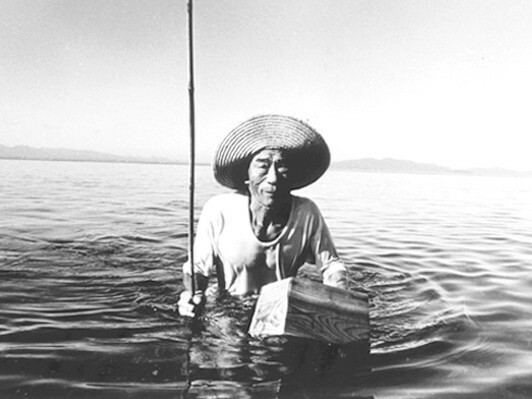 The lack of sync between the image and the sound, due to the lack of the right technology, was very common in Japanese independent documentary of the time; most of Ogawa Pro’s works of the Sanrizuka period, for instance, were affected by the same “problem”. This technical limitation forced directors, including Tsuchimoto, to combine images and sound in highly creative ways. The words and cries of the victims and of their families are often overlapped with images showing the tragic effects of mercury poisoning upon the residents of Minamata, in the fishing scenes that often punctuate the documentary, a beautiful and almost ancient music contributes to creating an epic atmosphere that envelops the lives of these fishing communities, the most impressive and famous of these shots depict an elderly man, who has lost his wife because of the disease, fishing for octopi. As a viewer watching the movie at the beginning of the 21st century, it is also worth noting that the images in black and white and the aforementioned lack of sync, pose as a further filter for the viewer, allowing Tsuchimoto to successfully avoid spectacularization of grief and the subsequent exploitation of the lives of the victims. We still see sick people and children whose lives were completely ruined, particularly touching is when in a series of harrowing scenes we are introduced to a young boy, who is drooling, staggering, and unable to move and speak freely. But the way the camera follows him and presents his and his family’s grief, is a form of respect that reveals his dignity as a human being. This attention towards the weak and the other is one of the highest achievements of Tsuchimoto’s body of work, it is a cinematic touch that serves also as a very powerful ethical statement on the meaning of being human, an approach that will reach a new level and culmination in The Shiranui Sea (1975), another documentary dedicated to the victims of Minamata. In the second part of the documentary, we follow the journey of the victims and their families to Osaka, where the Chisso biannual shareholders meeting took place in 1970. This trip to the second largest city in Japan is also important because Osaka is the place that in the same year (1970) housed the International Exposition. Together with the Tokyo Olympics in 1964, this international event helped to reposition Japan in the international political map and in doing so marked the complete admission of Japan to modernity and the Western world. Exposing the dark side of modernization, Tsuchimoto is thus making a very powerful political statement about the development of Japanese society and modern societies in general, revealing the unavoidable part maudite. The meeting between the leaders of Chisso corporation and the Minamata representatives almost resulted in a riot, with a sort of guerilla filmmaking reminiscent of the cacophony of Sanrizuka and the student protests, Tsuchimoto and director of photography Ōtsu Kōshirō show us the people of Minamata invading the stage and surrounding the CEO and his staff as if symbolically destroying the verticality between the zaibatsu and the people. Again here, as in the Sanrizuka documentaries of Ogawa Pro of the same time, the soul of the protest was feminine, and the ones who verbally confronted the Chisso CEO more than anyone else were in fact women and mothers driven by rage and grief. The opportunities to see Japanese documentaries outside of the archipelago are really few, and usually restricted to film festivals, especially when these works were shot in 16mm or 35mm. It is thus noteworthy that Minamata: The Victims and Their World, together with The Shiranui Sea and other Tsuchimoto’s works, is available on DVD with English subtitles through the dedicated work of independent label Zakka Films.